June 18, 2012— Technology is driving change in how one digests information and communicates. Educators are working to answer two important questions: What does it mean to be literate in the 21st century? How do teachers cultivate digital literacy for themselves as well as their students? Researchers at North Carolina State University examine this issue in a white paper recently released with contributions from Dell and the North Carolina’s Department of Public Instruction addressing the redefinition of literacy skills that allow for student success in today’s digital world and what this means for teachers. “Digital literacy is fast becoming an essential part of the curriculum. Positioning digital literacy as an entitlement for all students is critical to advancing North Carolina’s educational agenda,” said Dr. Hiller Spires, NC State University professor of literacy and technology and senior research fellow in the College of Education. Digital Literacies and Learning: Designing a Path Forward examines what it means to read, write and comprehend in a digital age, along with defining action steps educators can take to increase students’ digital literacies. Dr. Spires led the research and writing of the white paper, which was funded by NC State’s Strategic Research Initiative. Findings in the white paper outline the current state of digital literacy and what this means for teachers in the classroom. Education leaders, researchers, policy makers and industry leaders will benefit from further investigation into skills needed to navigate this new literacy landscape. Click here to read the white paper, Digital Literacies and Learning: Designing a Path Forward. 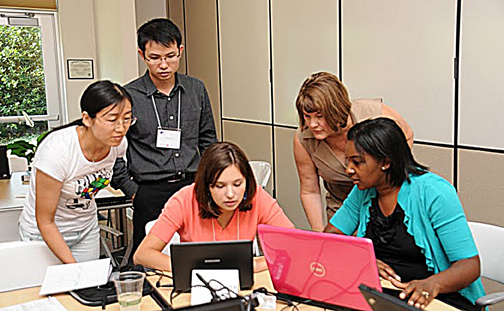 Research about digital literacy is being conducted by faculty and graduate students of the New Literacies Collaborative at NC State University’s College of Education in the Friday Institute for Educational Innovation. It is a center for fostering collaborations to improve education by bringing together students, teachers, researchers, policy-makers, educational professionals and community members.